Ross Daniel Davies was born on 15 March 1899 in Lead, Lawrence County, South Dakota. Anna Augusta Rosengren appeared in the US federal census of 15 April 1910 in Lead, Lawrence County, South Dakota, at 412 Miners Avenue. Other members of the household included Ross Daniel Davies, Charles Ellis Davies and Marion Violet Davies. Ross Daniel Davies registered for the draft on 12 September 1918 in Lawrence County, South Dakota, while living with his mother at 412 Miners Avenue in Lead, and employed there by the Homestead Mining Company. Anna Augusta Rosengren appeared in the US federal census of 1 January 1920 in Lead, South Dakota, at 412 Miners Avenue. Other members of the household included Ross Daniel Davies, Charles Ellis Davies. He married Marie Josephine Anderson on 24 June 1924 in Brookings, Brookings County, South Dakota, with Lutheran pastor Rev. B. A. Benson officiating. At the time of the marriage, residence of the bridegroom was Hayti, Hamlin County. Ross Daniel Davies and Marie Josephine Anderson appeared in the US federal census of 1 April 1930 in Brookings, South Dakota, at 919 Eighth Avenue. Other members of the household included Marion Jean Davies and Charles Ellis Davies. He was an Extension Service county agent, according to the 1930 census.. The following appeared on 10 September 1931 in the Lead Daily Call: Ross Davies, son of Mrs. Anna Davies, of Lead, returned to Brookings today. He came here to attend the funeral services yesterday for his uncle, the late Fred Ross, of Arpan. Mr. Davies is an instructor at State college, Brookings. Ross Daniel Davies and Marie Josephine Anderson appeared in the US federal census of 1 April 1940 in Brookings, South Dakota, at 921 Eighth Avenue. Other members of the household included Marion Jean Davies. He was employed by the federal government as a soil conservation supervisor, according to the 1940 census. The following appeared on 1 March 1946 in the Lead Daily Call: Mrs. Fred Ross entertained at a noon luncheon today in the Highland hotel for her nephews, Ross and Charles Davies and their families, of Huron, S. D., and Fredonia, Arizona. The following appeared on 30 May 1949 in the Lead Daily Call: Mr. and Mrs. Ross Davies of Huron came to Lead Saturday to join his brother and wife, Mr. and Mrs. Charles Davies, of Provo, Utah, who are spending a week at the home of Mr. and Mrs. W. A. Ferguson. Sunday afternoon a picnic gathering of relatives and friends was arranged in commemoration of the visit of the Davies, who are former Lead residents. Ross and Charles are sons of the late Mrs. Anna Davies. Ross Daniel Davies died on 24 June 1959 at age 60 in Huron, Beadle County, South Dakota. Marie Josephine Anderson became a widow at his death. The following appeared on 24 June 1959 in The Daily Republic: (Huron) Ross D. Davies, 60, South Dakota's state conservationist, died in a hospital here early Wednesday. He had undergone major surgery earlier this week but had seemed to be recoverintg. Davies had been head of the South Dakota Soil Conservation Service here since the job was created in 1942. 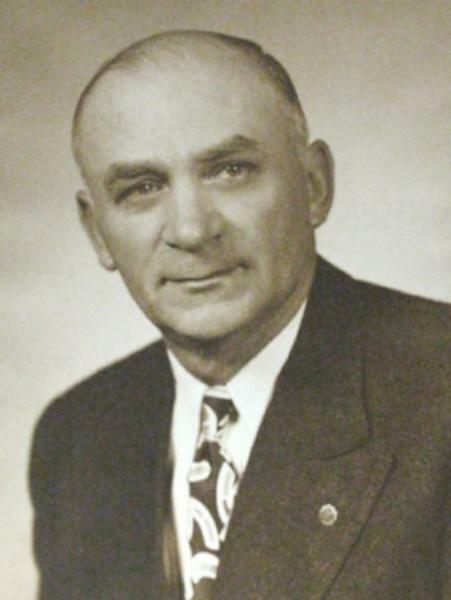 He had joined the conservation service in 1937 as state coordinator. Previous to that time Davies had been county agent in Hamlin and Lincoln Counties and had served at the state extension office at South Dakota State College in Brookings. Davies graduated from State college in 1923. He was born March 15, 1899 at Lead and was a veteran of World War I.
Davies was a member of the Izaak Walton League, Huron Chamber of Commerce, American Legion, Masonic Lodge and Rotary Club. Survivors include his widow, Marie; two daughters, Mrs. Robert DeKraay, Minneapolis, and Mrs. Duane Carson, San Diego; a sister, brother and four grandchildren. The following appeared on 24 June 1959 in the Deadwood Pioneer-Times: (Huron) Ross Davies, 60, Huron, South Dakota soil conservationist, died here Tuesday night following surgery last week. Davies, who had headed the State SCS since 1937, entered the hospital Friday and was believed making good recovery. He was a native of South Dakota being born in Lead on March 15, 1899. Davies was a graduate of Lead High School and State College. He was the son of the late Mrs. Anna Davies, who served as matron of the Hearst Kindergarten for about 35 years. He farmed near Belle Fourche for several years and was a veteran of World War I.
Davies became a county agent for Hamlin County in 1924, was an agent in Lincoln County in 1926, and became assistant county agent leader in 1928. In 1931 he became county agent leader for South Dakota. He married Marie Hanson, a college sweetheart. Today would have been the couple's 35th wedding anniversary. Davies is survived by his wife, two children, Mrs. Robert D. Dekraay and Mrs. Duane Carson, and four grand-children. Also surviving are a brother, Charles Davis, Brighton, Colo., formerly of Lead; and a sister, Mrs. Marian Hansen of Oshkosh, Wis.
Davies, long a member of most civic groups and many national soil conservation organizations, attended the Lutheran church. The SCS saw rapid growth under the direction of Davies. Nearly 90 per cent of all the land inclused by the districts is included in the group. There are now 68 SCS installations in South Dakota and nearly 35,000 farmers and ranchesrs belong to the group.